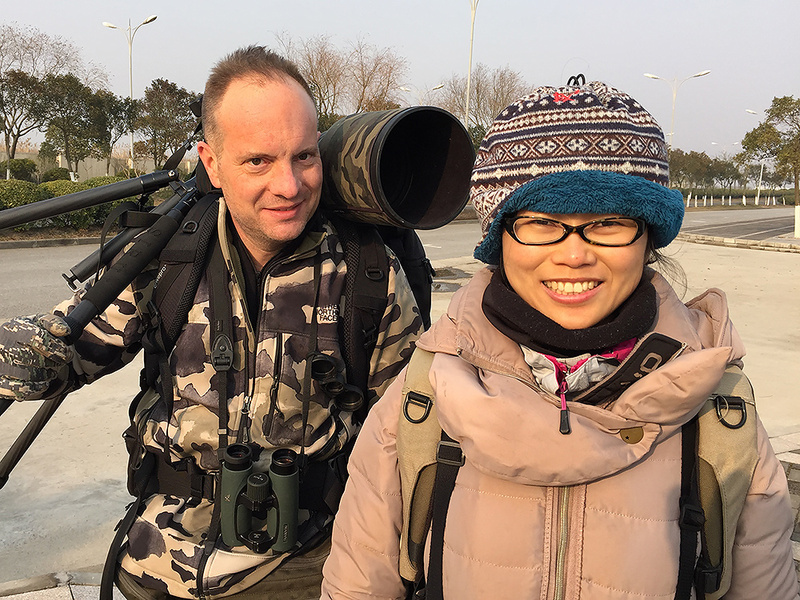 On 18-20 March 2016, Elaine Du, Kai Pflug, and I noted 89 species at Chongming, Dongtai, and Yangkou. 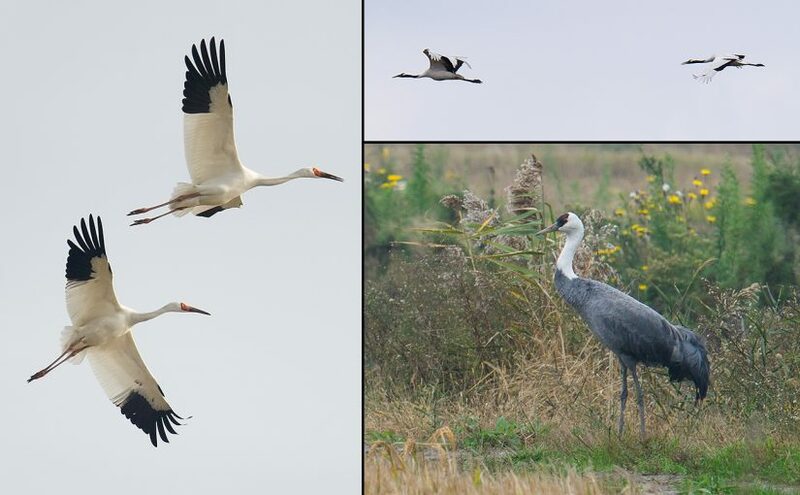 We found a dowitcher at Dongtai, and at Chongming we had 90 cranes so far away and in such thick fog that we were unable to determine how many were the expected Hooded Crane. 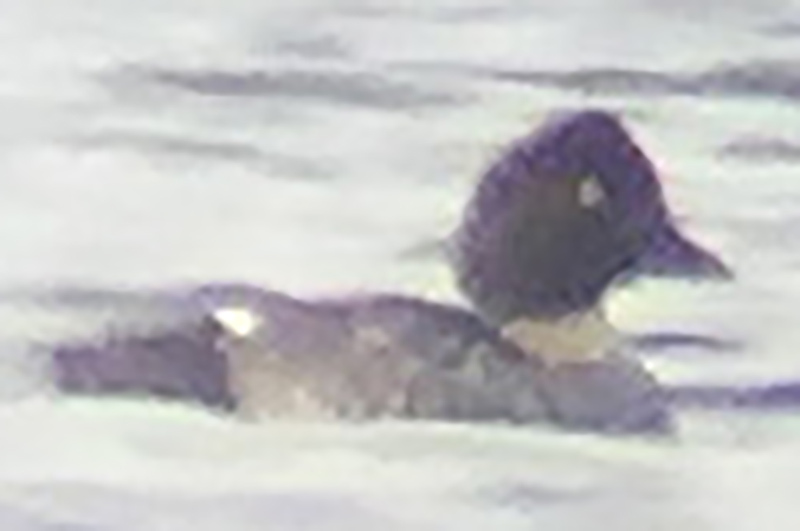 The canal at the base of the northeast Chongming sea wall gave us Common Goldeneye, Garganey, and Horned Grebe assuming breeding plumage and Black-necked Grebe in breeding plumage. 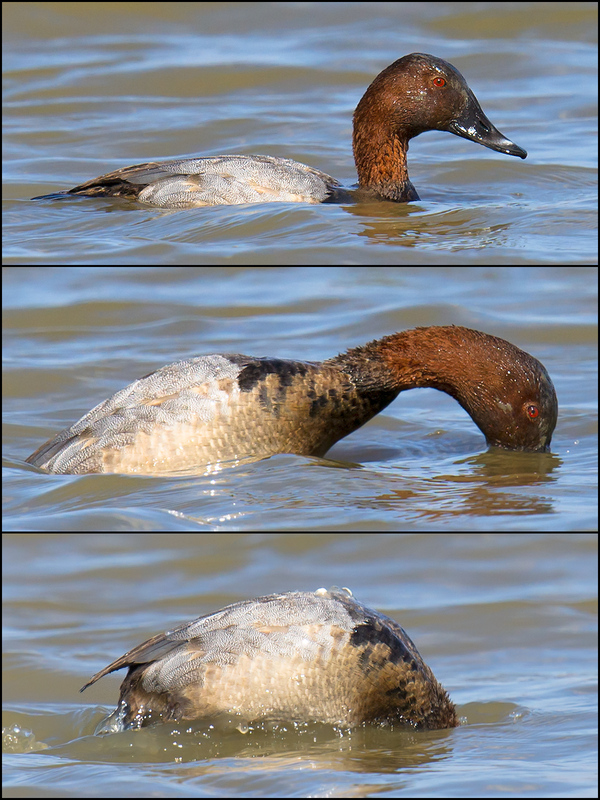 In addition to the dowitcher, Dongtai produced Greater Scaup, Common Merganser, and endangered Far Eastern Curlew and near-threatened Eurasian Oystercatcher as well as early Bar-tailed Godwit, Barn Swallow, and Bull-headed Shrike and singing Chinese Grey Shrike. Yangkou gave us early Black Drongo. 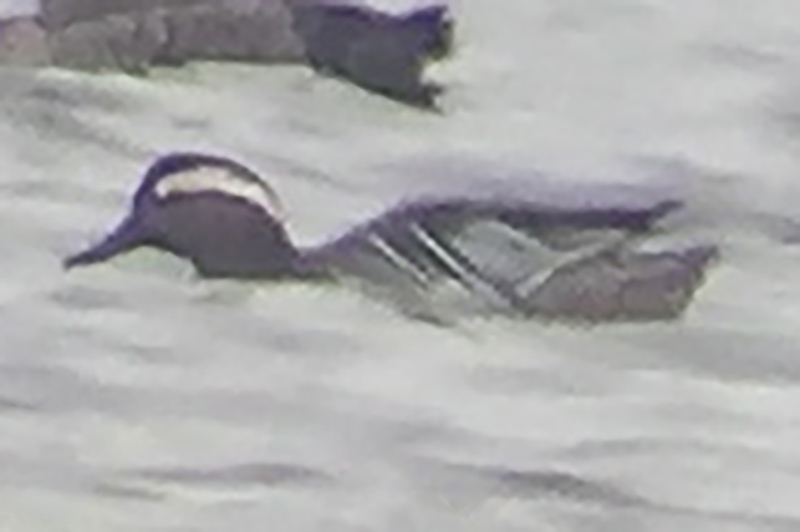 Garganey, Chongming, 18 March 2016, through the spotting scope. Anas querquedula is uncommon in Shanghai region. 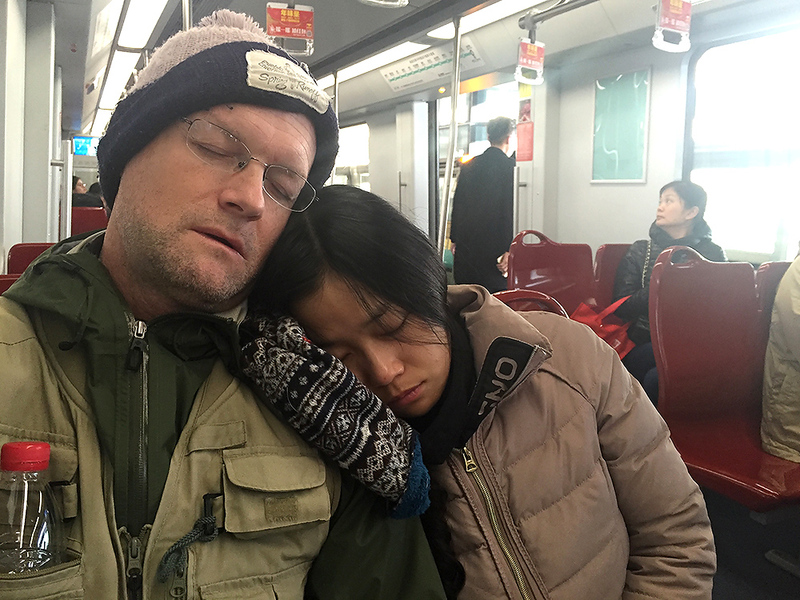 On Fri. 18 March Elaine and I left our apartment near Zhongshan Park in a Skoda Scout rented from Avis. We picked up Kai at his home in Jiading, Shanghai and drove to the ferry terminal on Changxing Island in the Yangtze River. Our plan was to take the ferry to Hengsha Island. The ferry was fogged out until at least 07:25, at which time we gave up and drove to Chongming. We noted 49 species there, our chief stops being a place rich in Common Snipe near the base of the eastern sea wall and the aforementioned canal where we found the goldeneye and grebes. 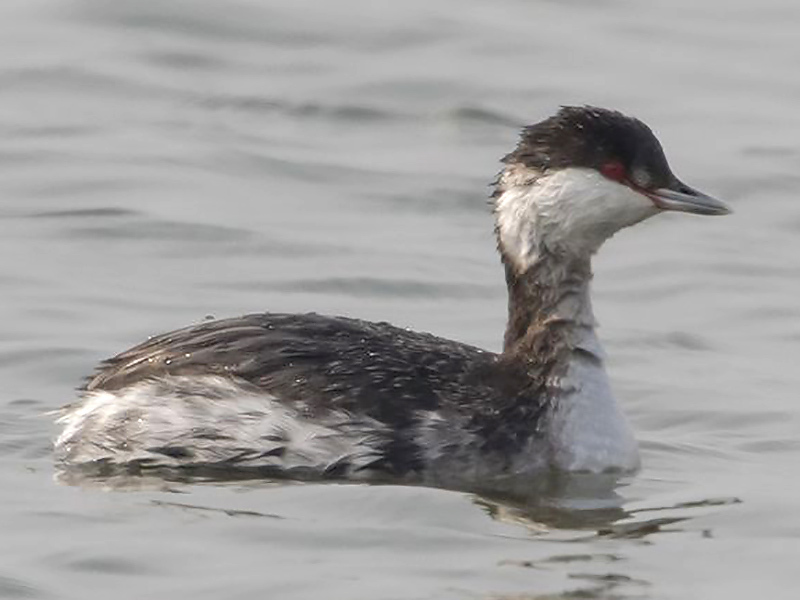 Black-necked Grebe, Chongming, Shanghai, 18 March 2016. Photo taken with iPhone 6 and Swarovski ATX-95 spotting scope. 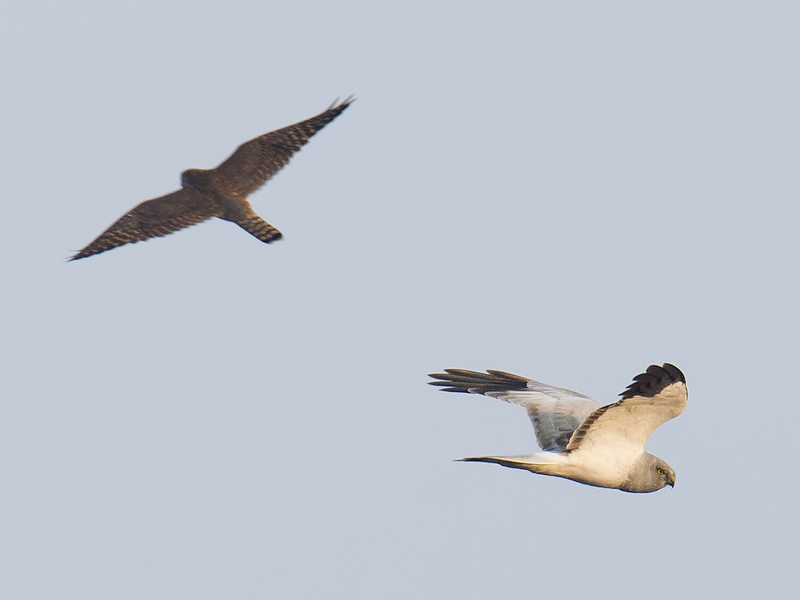 Middle bird still shows considerable winter plumage. After dark we drove 236 km north on the G40 and G15 to Dongtai. There, we set up for two nights at Greentree Inn (Gélín Háotài Jiǔdiàn [格林豪泰酒店], 160 yuan/night for clean, modern room with fast Internet and breakfast, +86 (0) 515-85820999; 32.749262, 120.850125). Sat. 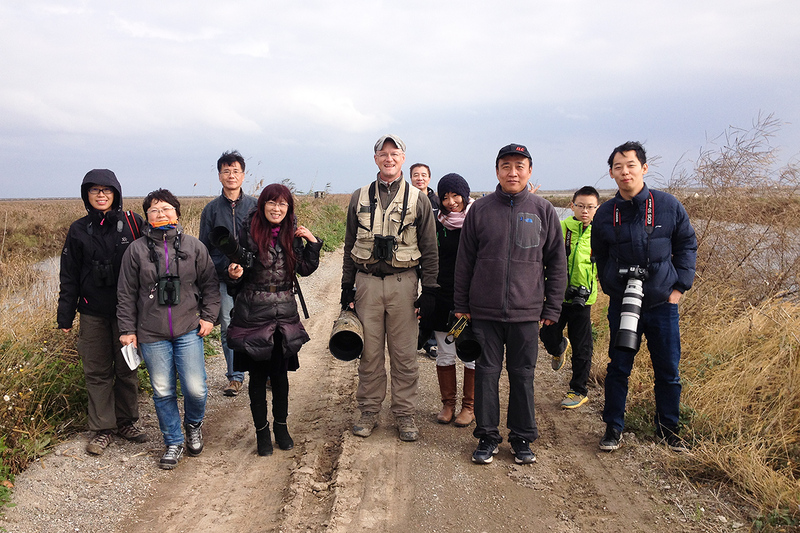 19 March saw us note 60 species around what Elaine and I call the Great Dongtai Surf ’n’ Turf Birding Trail. We had a neap tide that crested around 10:00, leaving the shorebirds far out. The godwit showed the slightly upturned bill and was associating with Eurasian Curlew, as was our lone Far Eastern Curlew. The dowitcher was far inside the sea wall and visible only through the spotting scope. It was showing more brown than grey and no orange. 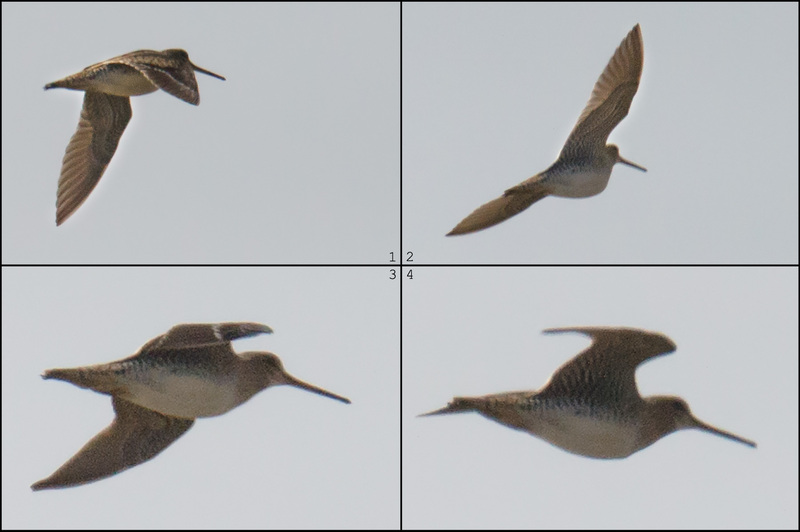 It had a long, seemingly straight bill like a snipe but unlike a typical snipe was alone in an area far from cover. We observed a clear sewing-machine feeding motion. 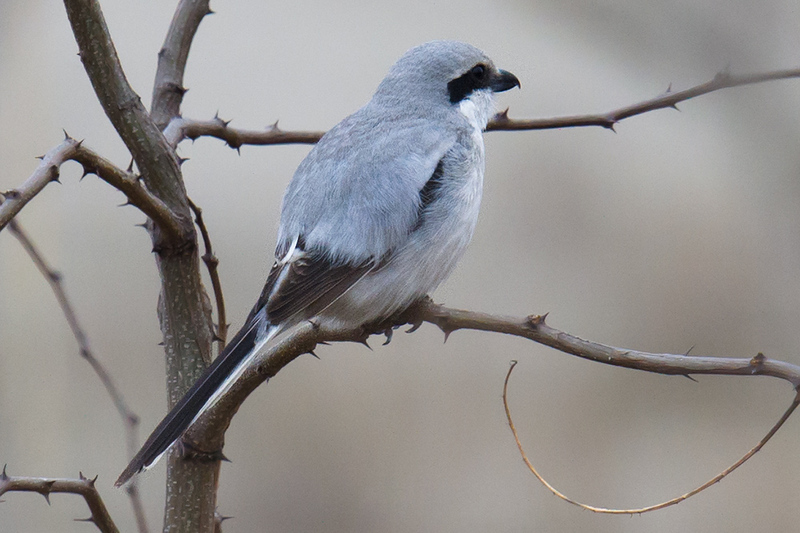 Chinese Grey Shrike Lanius sphenocercus sphenocercus at NE corner of Great Dongtai Surf ’n’ Turf Birding Trail, 19 March 2016. Intensive work is under way around the southeast corner of the reclaimed area. Digging machines were working throughout the weekend dredging up canals, changing forevermore areas where only last year Elaine and I found breeding Common Tern and territorial and possibly breeding Pied Avocet. The plan, clearly spelled out on the billboards near the tourist facilities, is to give nearly the entire reclaimed area over to aquaculture. 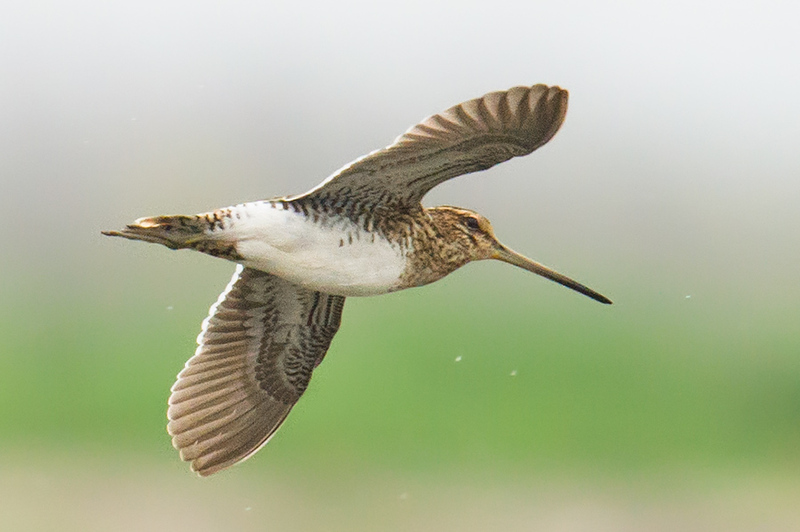 The Great Dongtai Surf ’n’ Turf Birding Trail offers the best coastal birding within 500 km of Shanghai, it is a critical staging area for Nordmann’s Greenshank and Spoon-billed Sandpiper, it is relied upon by Black-faced Spoonbill, Great Knot, and Far Eastern Curlew–and it is being transformed, utterly. 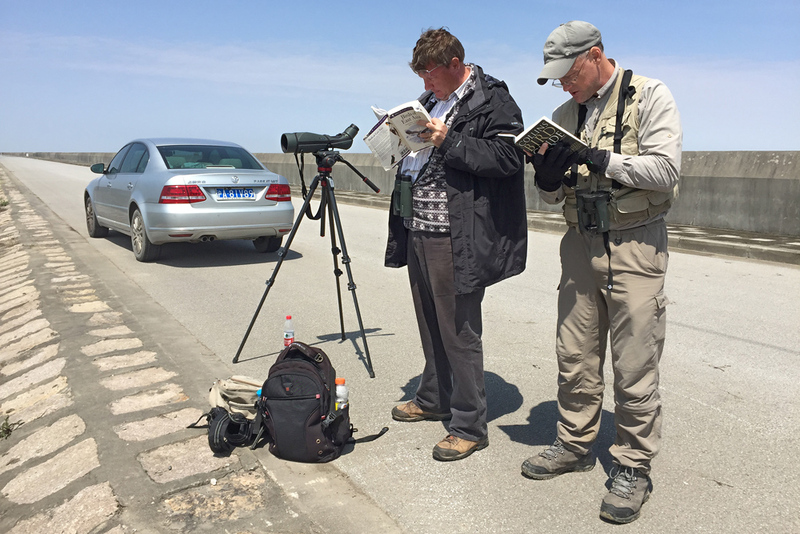 How interesting it is to be birding at this moment in history on the Chinese coast, scene of an ecological disaster like few ever seen before. On Sunday morning 20 March we again covered the Surf ’n’ Turf Trail. We moved down to Yangkou in the afternoon, and we sneaked in an hour’s worth of birding at Chongming on the way back to the city. At Yangkou we failed to note Brown-cheeked Rail at the spot where I have seen the species three times before. We used playback off and on for about 45 minutes and got no response. Reed Parrotbill were in the area. At the snipe spot on Chongming, I photographed as many of the flushed snipe as possible, trying to find Jack, Pin-tailed, or Swinhoe’s. 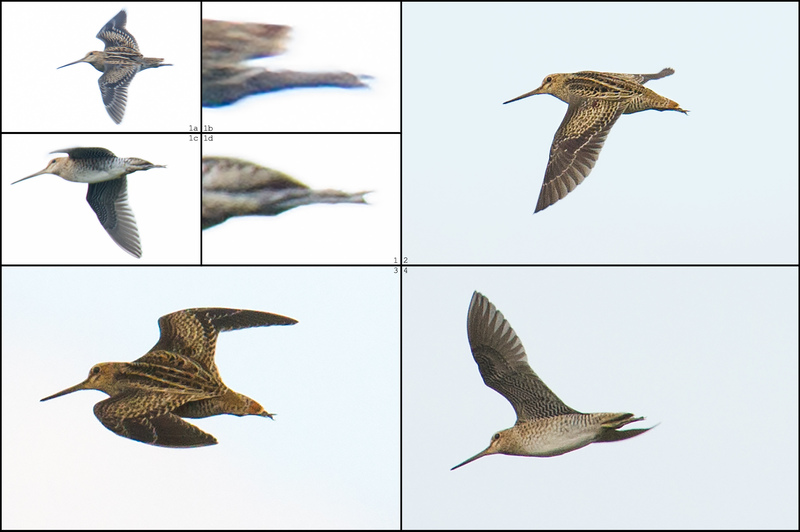 The photos I got show only Common Snipe. 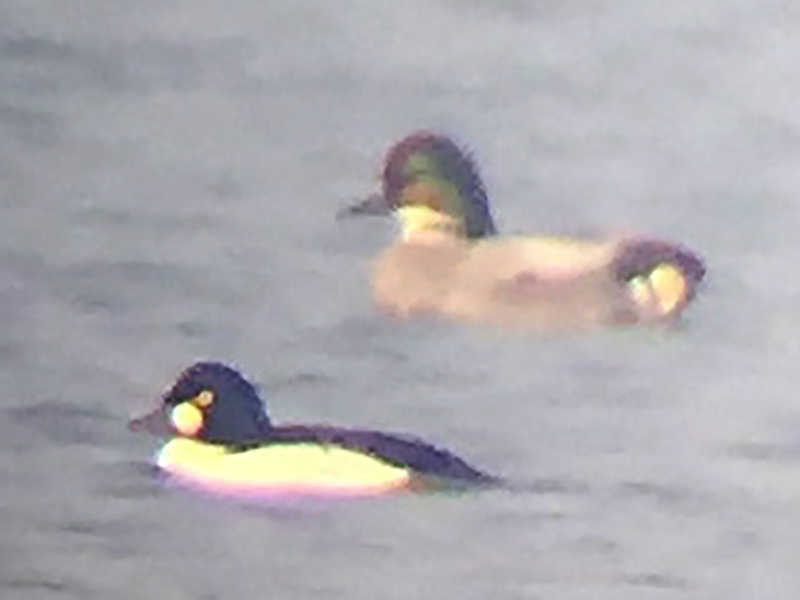 Common Goldeneye, Chongming, Shanghai, 18 March 2016. Photo taken with iPhone 6 and Swarovski ATX-95 spotting scope. Around Chongming Dongtan National Bird Sanctuary and Nature Reserve (Chóngmíng Dōngtān Niǎolèi Guójiājí Zìrán Bǎohùqū [崇明东滩鸟类国家级自然保护区]), Chongming Island, Shanghai, China (31.510109, 121.961955). Cloudy; low 11° C, high 18° C. Wind N 6 km/h. Visibility 10 km. PM2.5 AQI: 231 (very unhealthful). Sunrise 05:59, sunset 18:05. FRI 18 MAR 2016 08:30-17:05. Craig Brelsford, Elaine Du, & Kai Pflug. 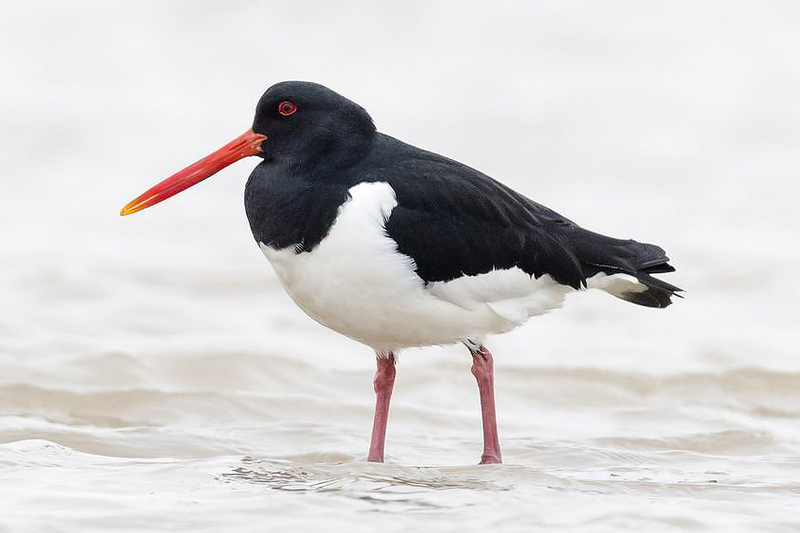 Eurasian Oystercatcher photographed by Kai Pflug on mudflats at Dongtai, Jiangsu, 19 March 2016. Haematopus ostralegus is listed as near-threatened by the IUCN. It is fairly easy to see throughout the year at Dongtai. Kai got this image with his Nikon D810 attached to his new 800 mm F/5.6 lens. F/7.1, 1/640, ISO 640. 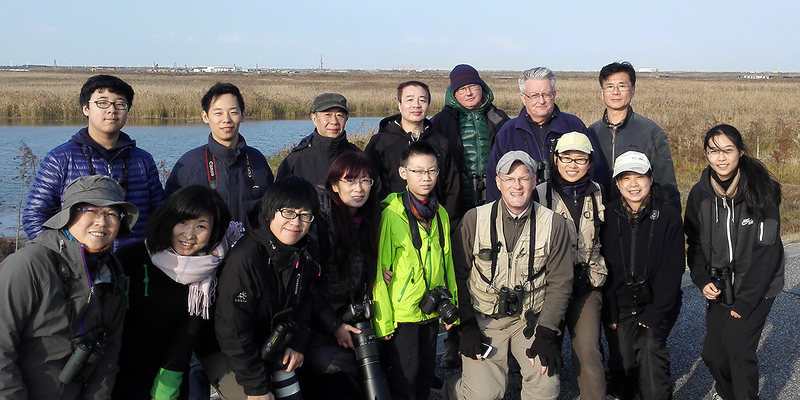 Great Dongtai Surf ’n’ Turf Birding Trail, a 40-km loop on coast of Dongtai (Dōngtái [东台]), a county-level city in Jiangsu, China. Important points on Trail are N entrance to new sea-wall road on Dongtai Levee Road (Dōngtái Hǎidī [东台海堤], 32.868218, 120.912340), T-junction on Dongtai Levee Road (32.855576, 120.896557), SE corner of sea wall (32.759499, 120.962893), & NE corner of sea wall (32.872444, 120.951522). Sunny, hazy; low 4° C, high 17° C. Wind NE 11 km/h. Visibility 10 km. PM2.5 AQI: 142 (unhealthful). Sunrise 06:02, sunset 18:11. SAT 19 MAR 2016 06:40-17:00. Craig Brelsford, Elaine Du, & Kai Pflug. List 1 of 3 for Sun. 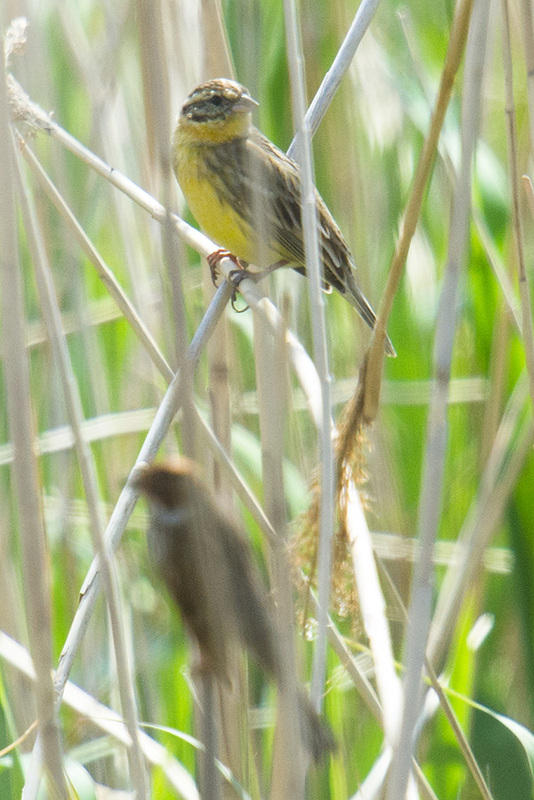 20 March 2016 (46 species). 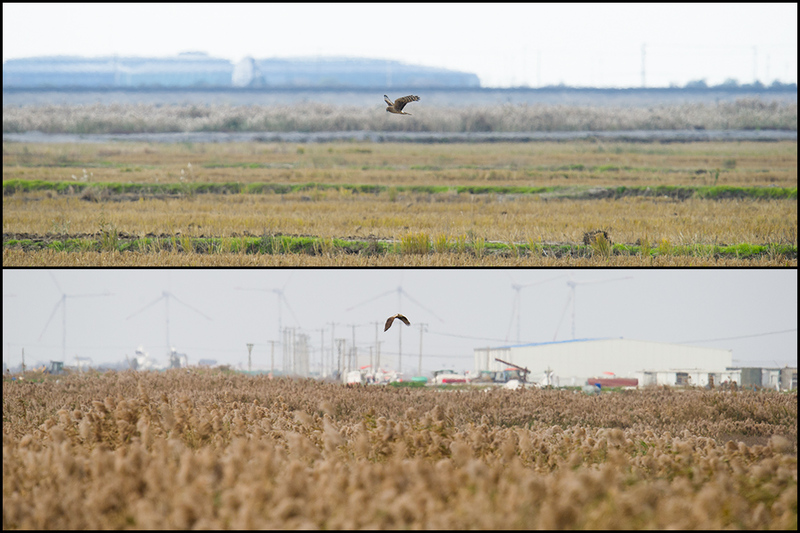 Great Dongtai Surf ’n’ Turf Birding Trail, a 40-km loop on coast of Dongtai (Dōngtái [东台]), a county-level city in Jiangsu, China. 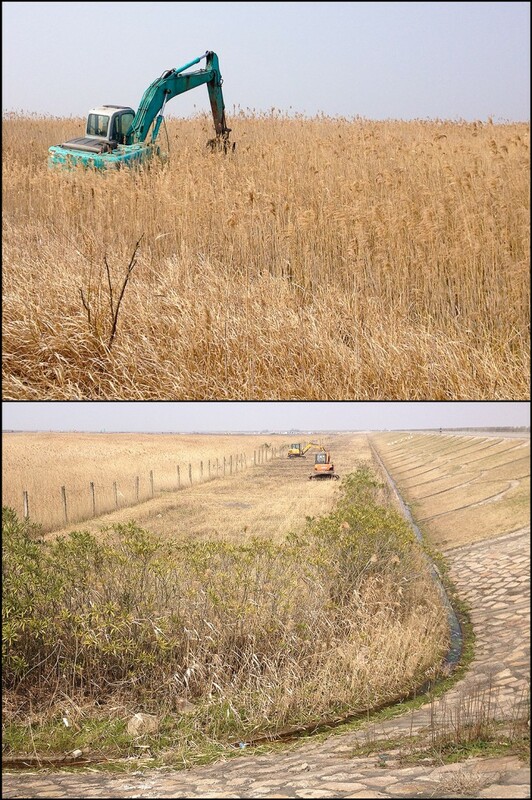 Important points on Trail are N entrance to new sea-wall road on Dongtai Levee Road (Dōngtái Hǎidī [东台海堤], 32.868218, 120.912340), T-junction on Dongtai Levee Road (32.855576, 120.896557), SE corner of sea wall (32.759499, 120.962893), & NE corner of sea wall (32.872444, 120.951522). Cloudy; low 7° C, high 12° C. Wind NE 18 km/h. Visibility 10 km. PM2.5 AQI: 112 (unhealthful). Sunrise 05:57, sunset 18:06. SUN 20 MAR 2016 08:10-12:10. Craig Brelsford, Elaine Du, & Kai Pflug. 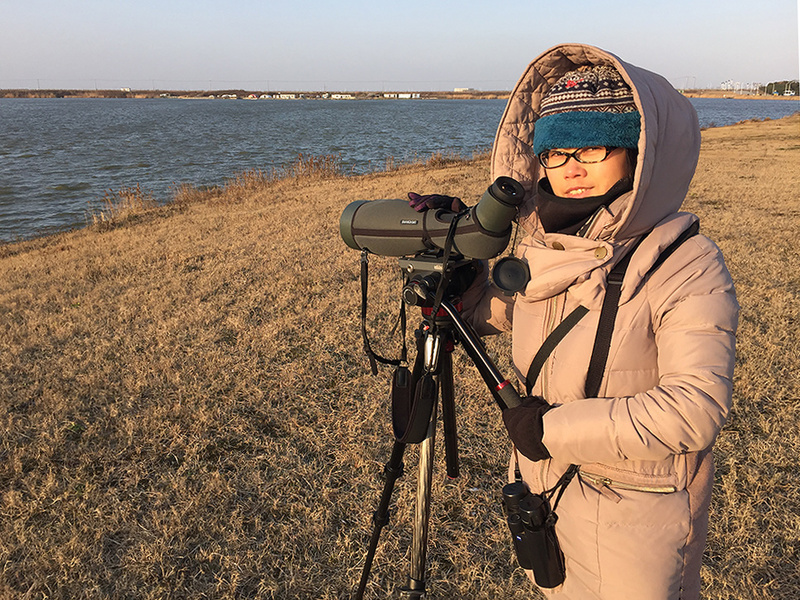 Elaine Du waiting for Brown-cheeked Rail, which did not show this time, at the reed beds near Haiyin Temple, Yangkou, Rudong, Jiangsu, 20 March 2016. 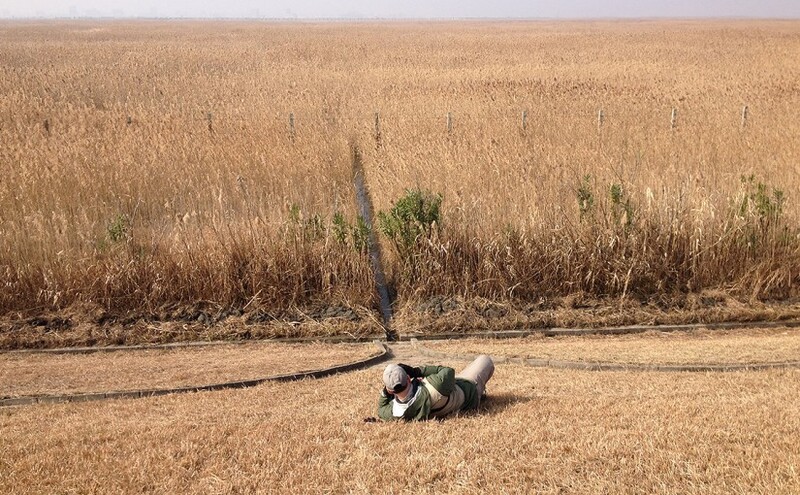 Area is at 32.557387, 121.037381 and is reliable for Reed Parrotbill and often reliable for Brown-cheeked Rail. Yangkou (Yángkǒu [洋口]), fishing town in Rudong County (Rúdōng Xiàn [如东县]), Jiangsu, China (32.537730, 121.017746). Area visited: reed beds near Haiyin Temple (32.557387, 121.037381). Cloudy; low 7° C, high 12° C. Wind NE 18 km/h. Visibility 10 km. PM2.5 AQI: 112 (unhealthful). Sunrise 05:57, sunset 18:06. SUN 20 MAR 2016 13:20-14:30. Craig Brelsford, Elaine Du, & Kai Pflug. List 3 of 3 for Sun. 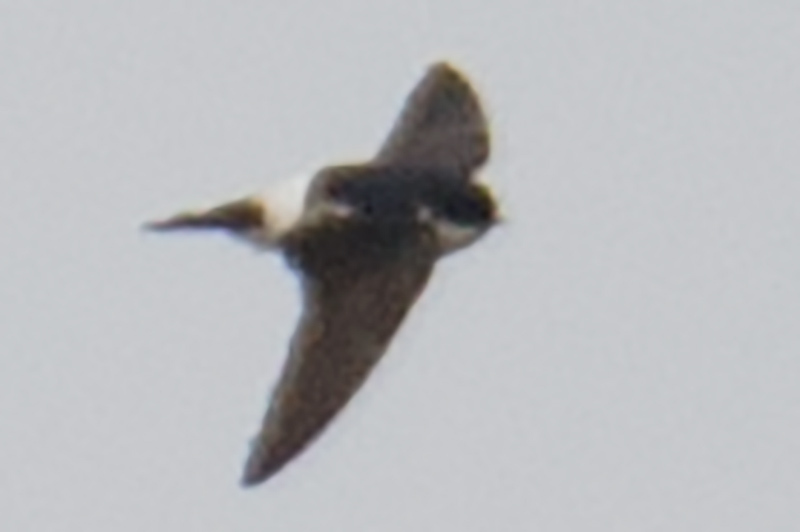 20 March 2016 (14 species). Around Chongming Dongtan National Bird Sanctuary and Nature Reserve (Chóngmíng Dōngtān Niǎolèi Guójiājí Zìrán Bǎohùqū [崇明东滩鸟类国家级自然保护区]), Chongming Island, Shanghai, China (31.510109, 121.961955). Cloudy; low 7° C, high 12° C. Wind NE 18 km/h. Visibility 10 km. PM2.5 AQI: 112 (unhealthful). Sunrise 05:57, sunset 18:06. SUN 20 MAR 2016 17:00-18:00. Craig Brelsford, Elaine Du, & Kai Pflug. 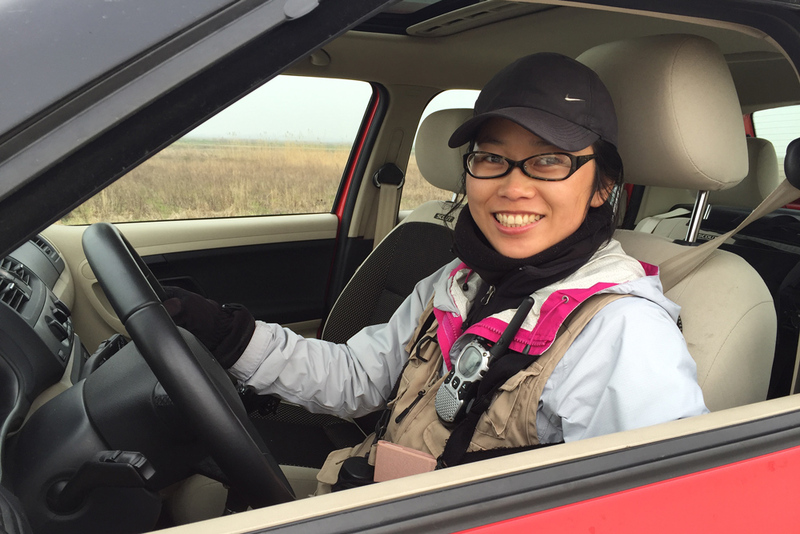 Elaine Du behind the wheel at Chongming, 18 March 2016. 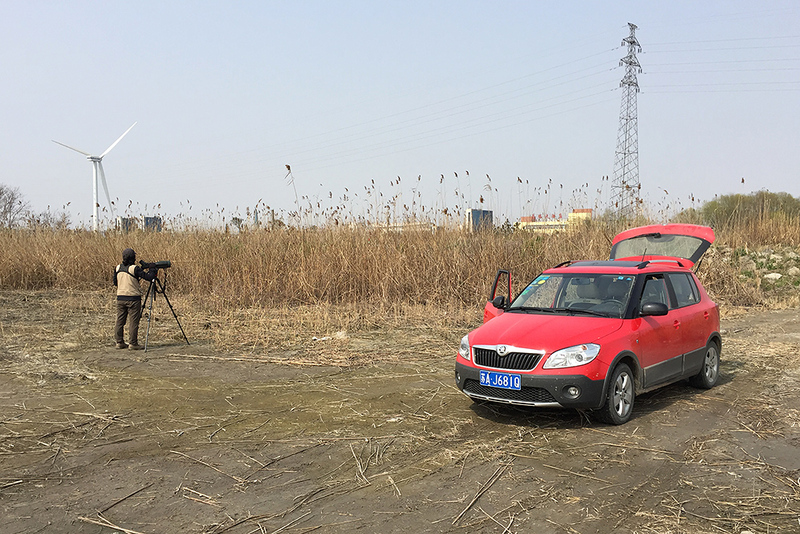 As well as keeping the list, my wife, proud holder of a Chinese driver’s license, occasionally performs driving duties during our birding trips. 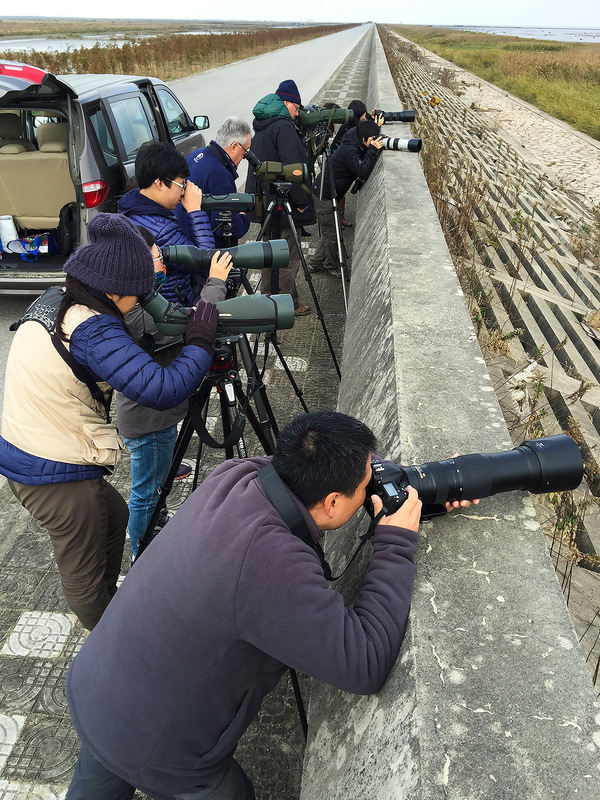 Featured image: German photographer Kai Pflug (L) and Craig Brelsford viewing Black-necked Grebe, Chongming Island, Shanghai, 18 March 2016. Photo shows our arrangement well. Kai emphasizes photography, using his incredible new 800 mm F/5.6 lens. 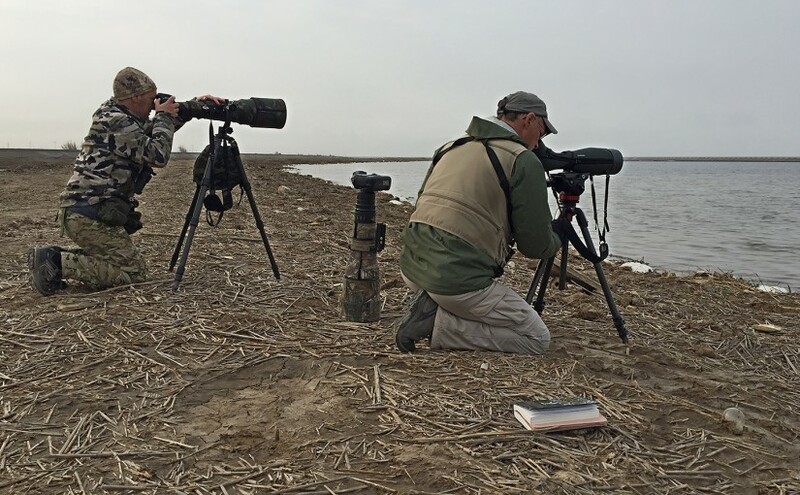 Craig is still in the photo game (see camera to his left) but is focusing more these days on bird ID, as evidenced by his use of his Swarovski ATX-95 spotting scope. Photo by Elaine Du. 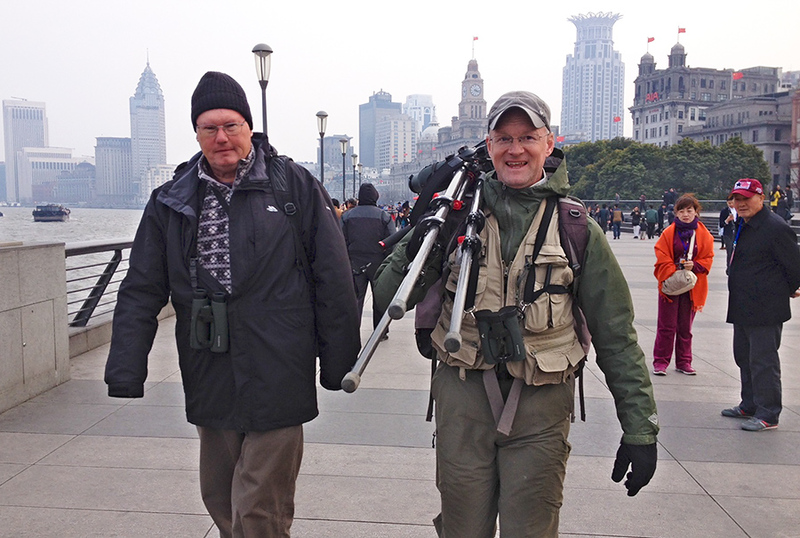 On 30-31 Jan., Elaine and I noted 75 species at Nanhui, Hengsha, and Chongming. 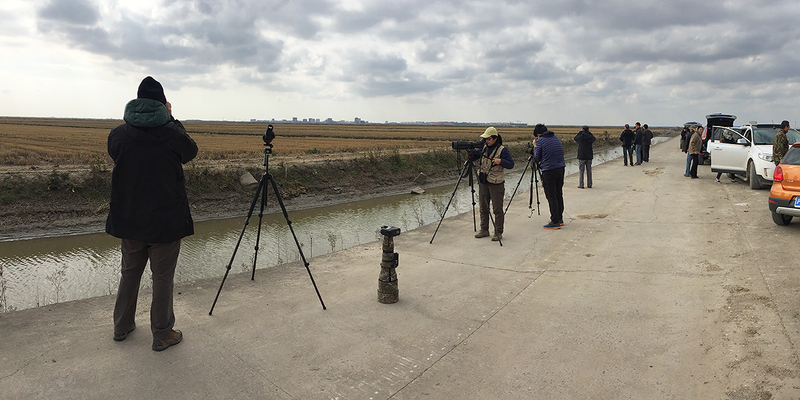 We had 6 Lapland Longspur on Chongming and 50 Mew Gull at Nanhui. The pair of Cinereous Vulture remain on Chongming, and we saw a good portion (65) of the Hooded Crane wintering on the great alluvial island. 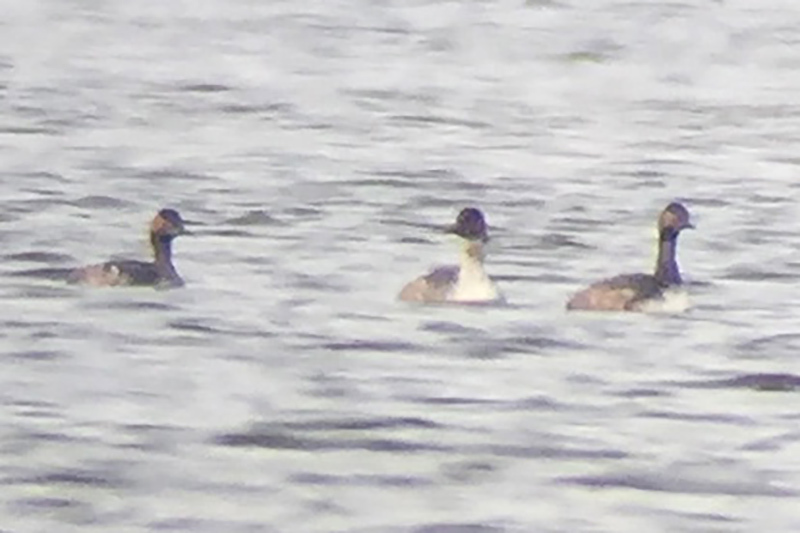 Red-throated Loon was still at Nanhui, and Dishui Lake once again held Greater Scaup (8), Common Goldeneye, and Horned Grebe (3). We had an impressive 350 Northern Pintail in the sea off Nanhui, and though numbers of Gadwall (590) and Falcated Duck (720) were lower than in November, the species maintain a sizable presence on Hengsha. 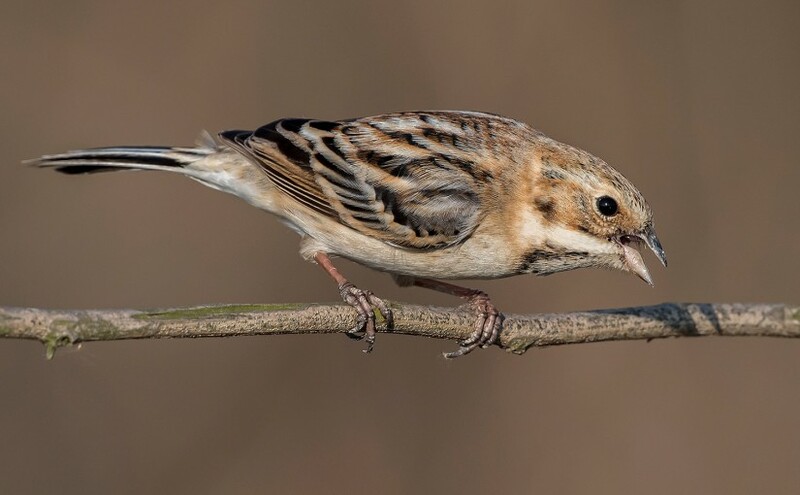 Lapland Longspur, Chongming, Shanghai, 31 Jan. 2016. The longspurs appeared late Sunday, just as snow was starting to fall. 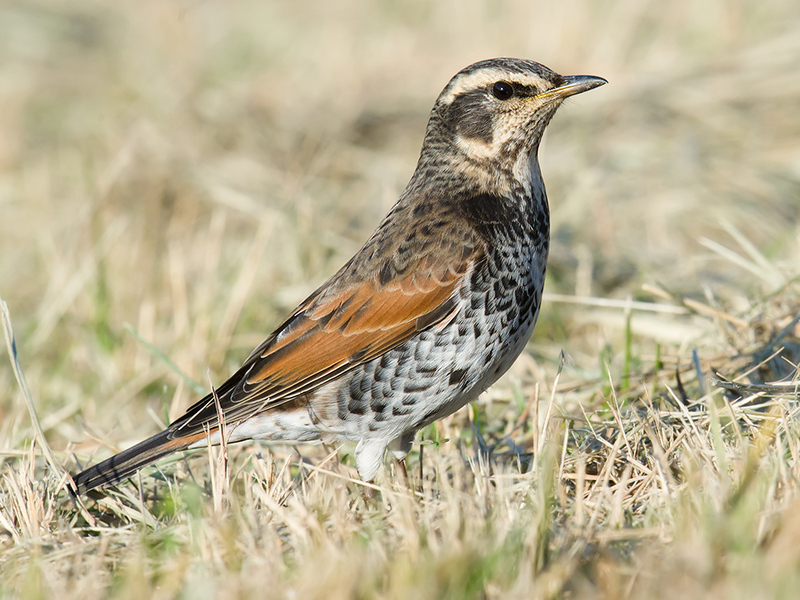 The inclement weather must have upset the Buff-bellied Pipit, Eurasian Skylark, and Eurasian Tree Sparrow using the recently plowed fields. Suddenly birds were flying everywhere. 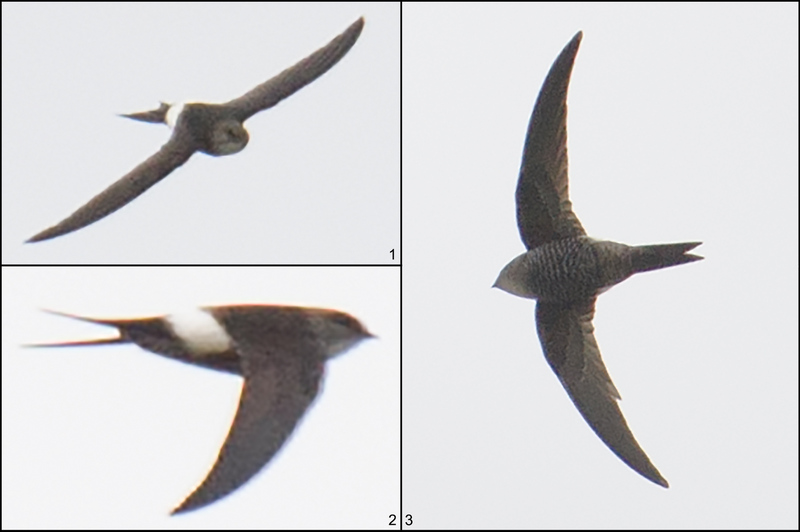 The grey sky made visual ID difficult, but some of the birds were calling and identifiable by call. 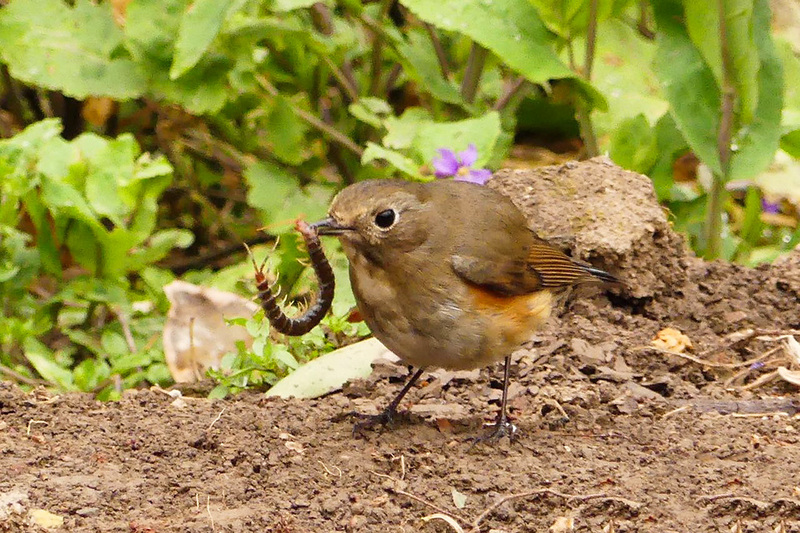 But not all; so I took a flurry of record shots. 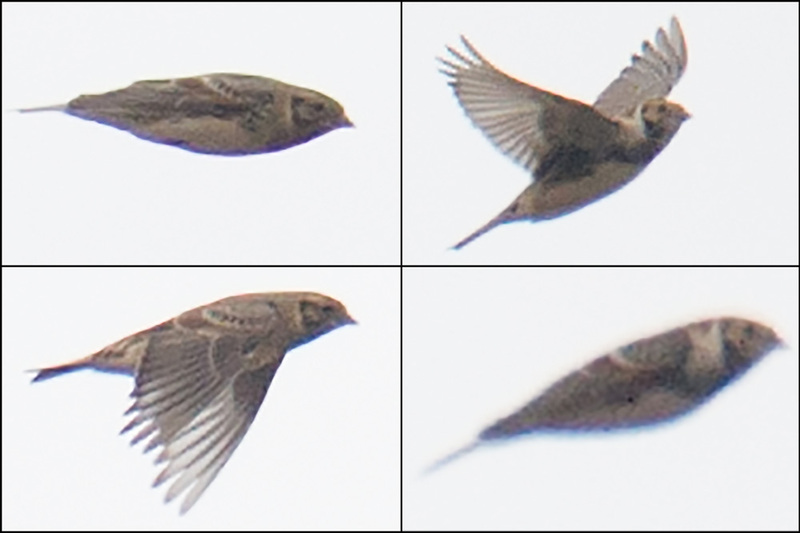 In one series of images was a bird I had never seen before. 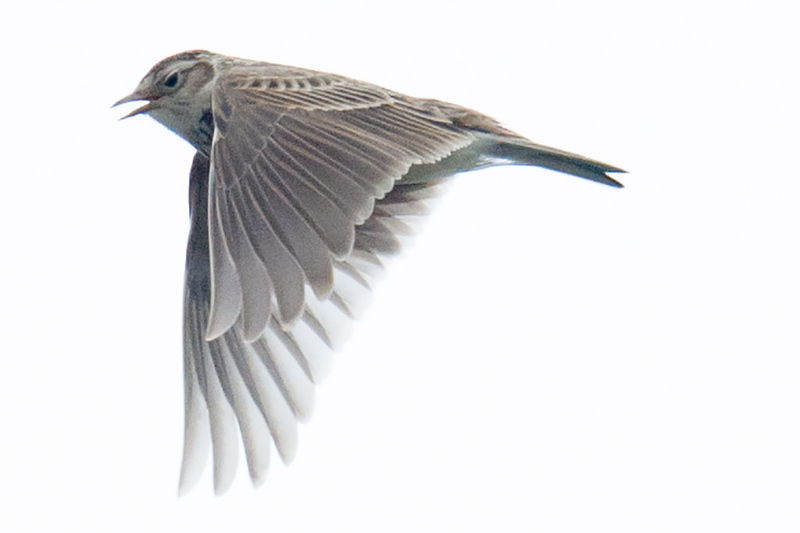 I sent some of the images to Jan-Erik Nilsén, who told me that the facial pattern was typical of Lapland Longspur. And so it was. 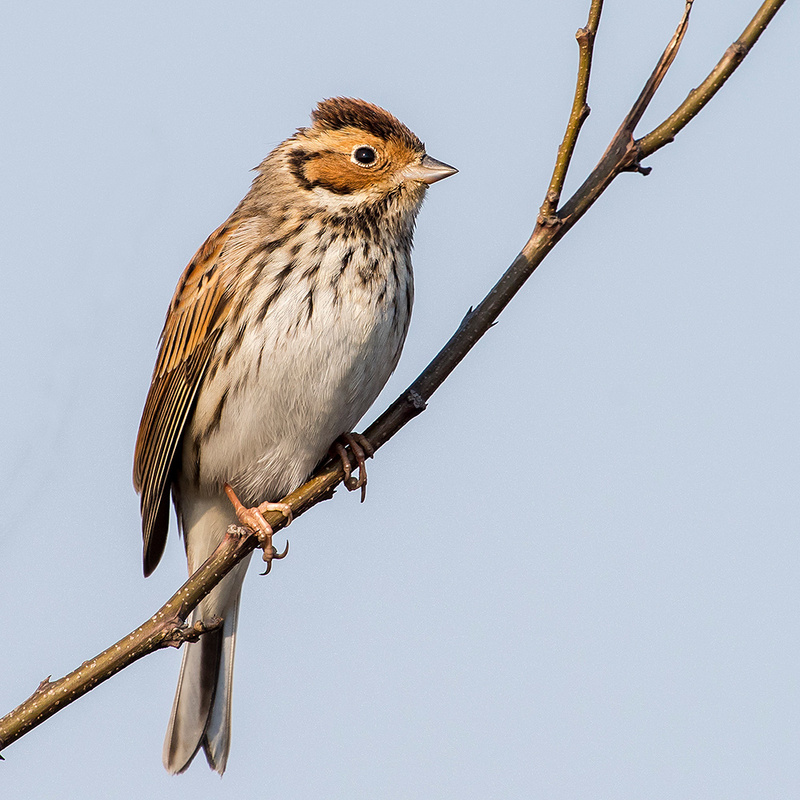 MacKinnon says Calcarius lapponicus “winters in small numbers along bare meadows along E coast between 30° and 40° N and along Changjiang River”; that is a box into which our situation neatly fits. This 3-species-in-1 image shows 2 Kamchatka Gull (bottom L, top R), Vega Gull (large gull in middle), and Black-headed Gull (bottom R). Note the ‘kinder’ look of Larus canus kamtschatschensis; its more rounded head, in contrast to the more gently sloping forehead of the Vega; and its smaller size in comparison to Vega. Nanhui, 30 Jan. 2016. 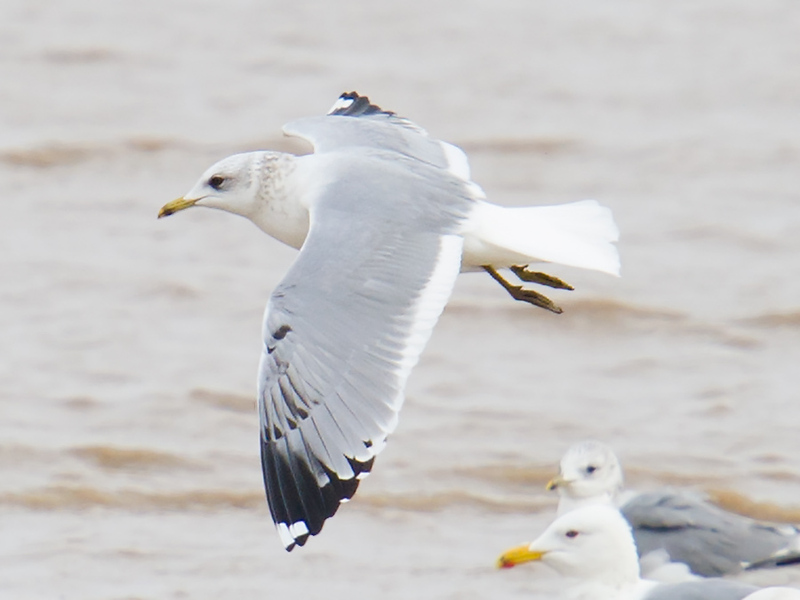 The views of Mew Gull Larus canus came about because of preparation and luck. 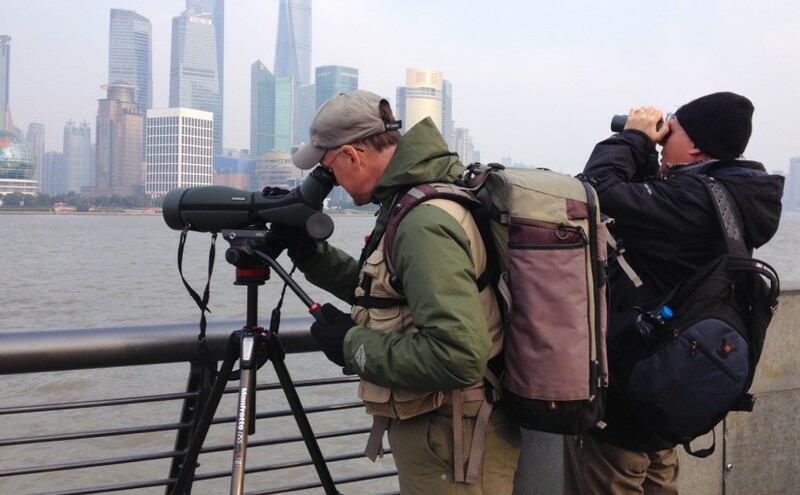 Ever since Michael Grunwell moved to Shanghai last year, he has been telling me to look for Mew Gull in Shanghai; he was sure it would show up here in winter. Bolstering that suspicion was a recent report from Jonathan Martinez of Mew Gull in Guangdong. Kamchatka Gull Larus canus kamtschatschensis, Nanhui, 30 Jan. 2016. L. c. kamtschatschensis is larger and darker than the western forms L. c. canus and L. c. heinei. L. c. heinei is known to occur on the China coast and should be looked out for. At Nanhui, gulls usually appear here and there. 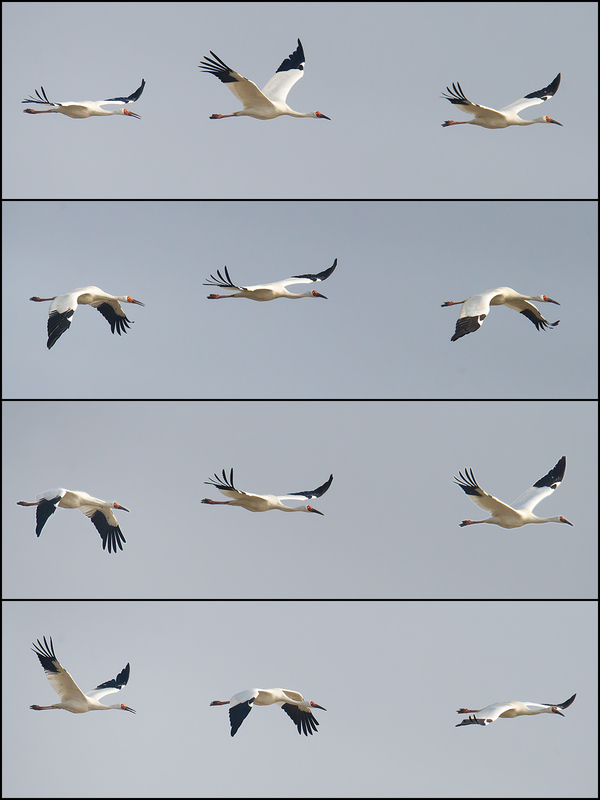 On Saturday, Elaine and I finally had a chance to view a large group. An afternoon tide was coming in just right, boxing about 300 gulls into a corner of the sea wall. Elaine and I were waiting with camera and spotting scope. “This is the day!” I said. 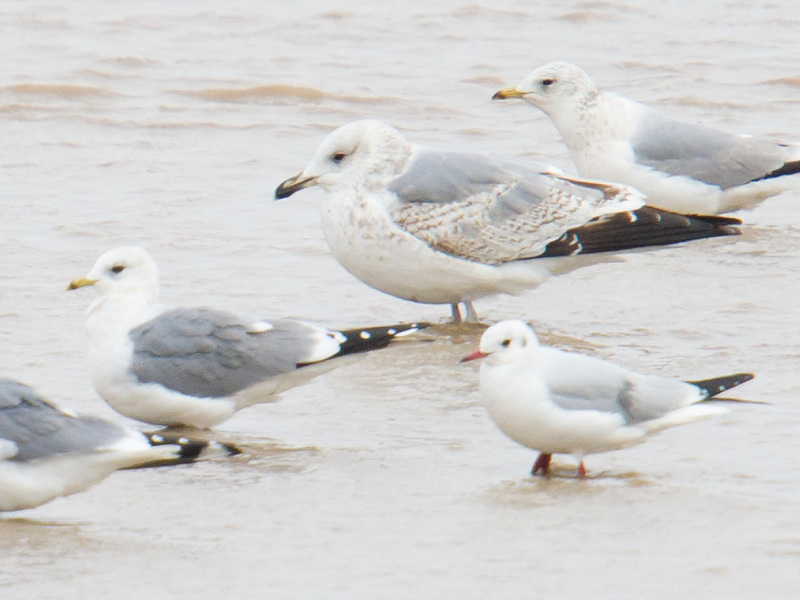 Sure enough, among the dozens of Vega Gull and Black-headed Gull was a sizable element of Mew. We quickly distinguished them from the much larger Vega. The Mew we photographed seem to have a squarer head and beadier eye than would be the case with race heinei; we therefore believe our gulls are Kamchatka Gull Larus canus kamtschatschensis. The Red-throated Loon was in the large pond behind the Holiday Inn and Magic Parking Lot. Elaine found it doing the scan. Six days earlier, we had 3 Red-throated Loon in a pond a few kilometers north. 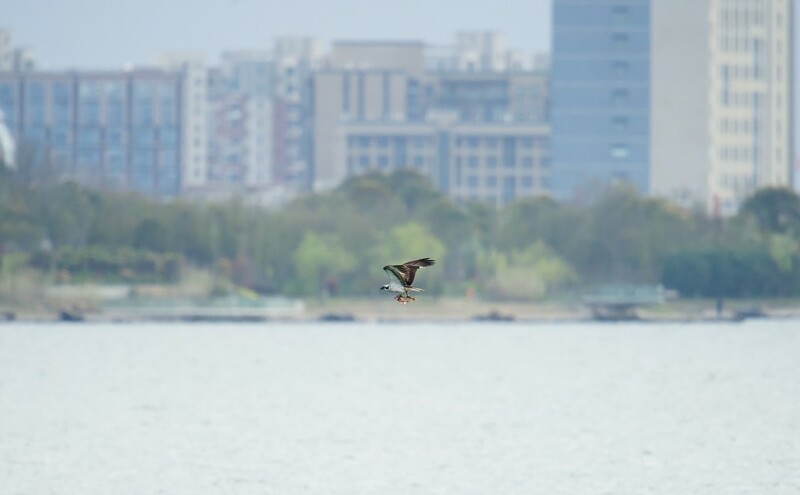 Around 500 of our Great Cormorant were perching on the giant ring in the middle of Dishui Lake. 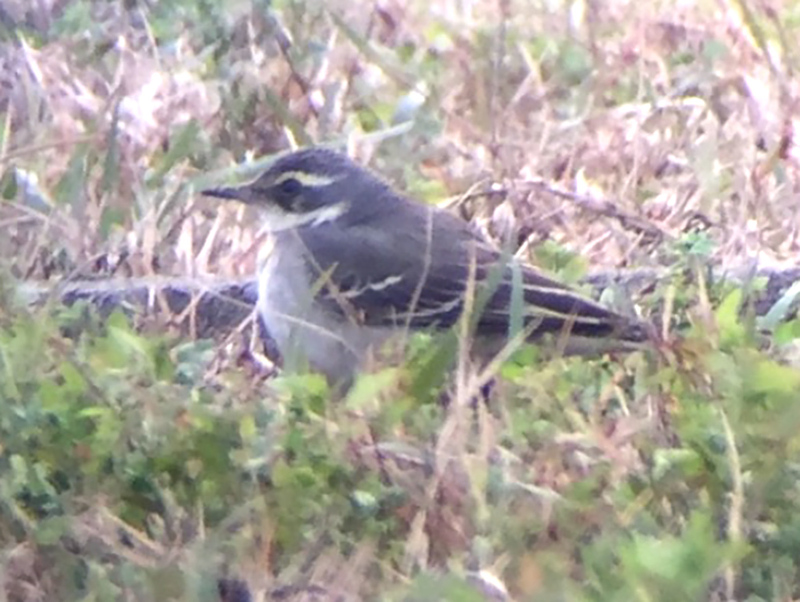 Driving along the sea wall, we saw a Red-throated Pipit eating seeds left over from the rice harvest, and in the mud below we found three bright-yellow taivana Eastern Yellow Wagtail. Rather than drive back to the city, Elaine and I drove straight to Changxing Island and took the ferry to Hengsha. We spent Saturday night at Héngshā Bànrìxián Mínsù (横沙半日闲民宿; +86 135-0185-1814 and +86 150-2164-5467; 120 yuan). 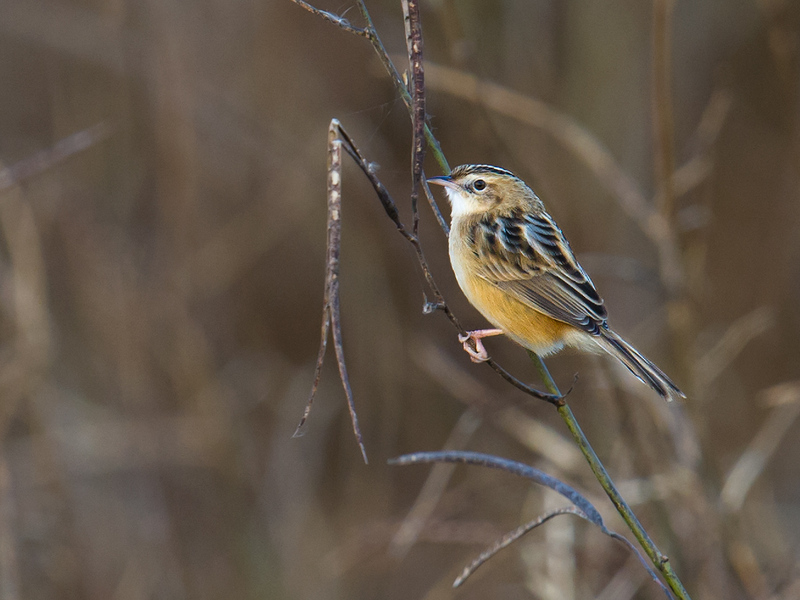 Sunday brought 56 species on Hengsha and Chongming. 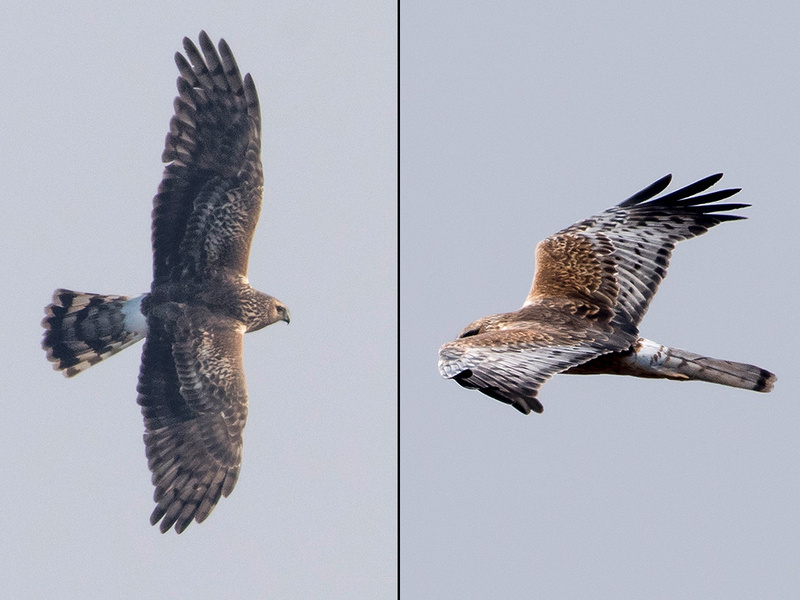 Our stay of a little more than five hours on Hengsha revealed no extraordinary birds. Eurasian Bittern were unusually visible; 3 of the 5 we noted were standing more or less in the open. We took the ferry back to Changxing Island, and there, sitting in traffic, I happened to look out the window of our Skoda Scout and saw 3 Goldcrest. We took the Shanghai-Changjiang Bridge across the Yangtze to Chongming. After more than two weeks on Chongming, our Cinereous Vulture appear to be doing fine. Here they were yesterday. The Cinereous Vulture were a few kilometers south of the place where we had found them eight days earlier. 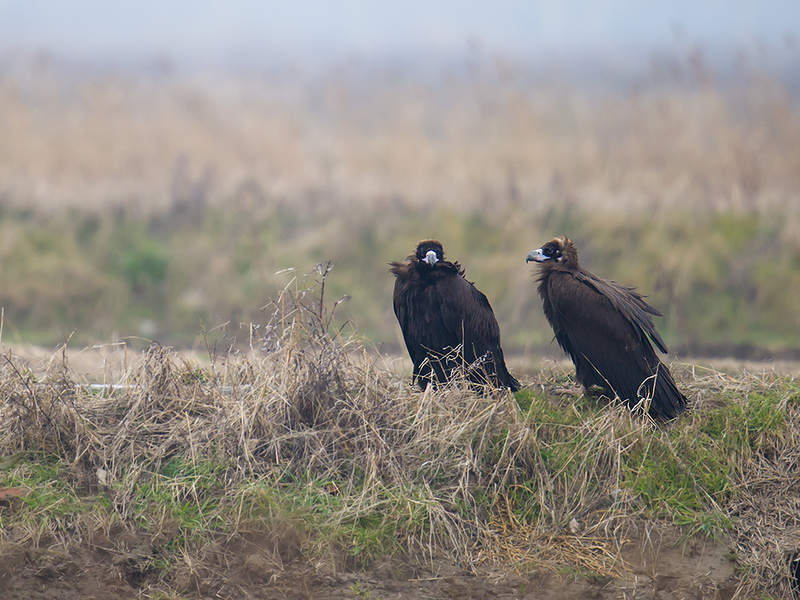 As before, the vultures were standing on an earthen bank along the first row of fields behind the canal at the base of the sea wall. Nearby were the Hooded Crane and 21 Common Crane. 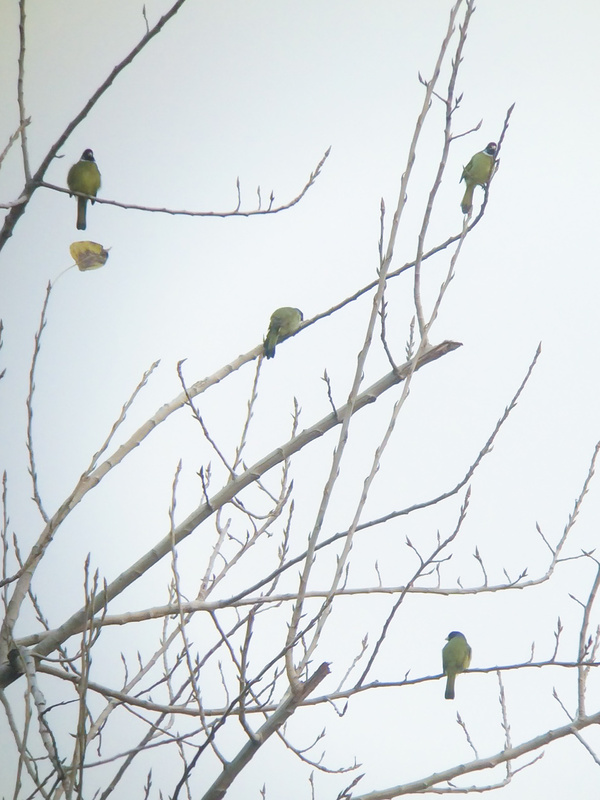 The cold, grey day was enlivened by a colorful flock of 55 Grey-capped Greenfinch. Mew Gull and Lapland Longspur became the 267th and 268th species of bird Elaine and I have noted in the Shanghai region since 11 Sept. 2015. 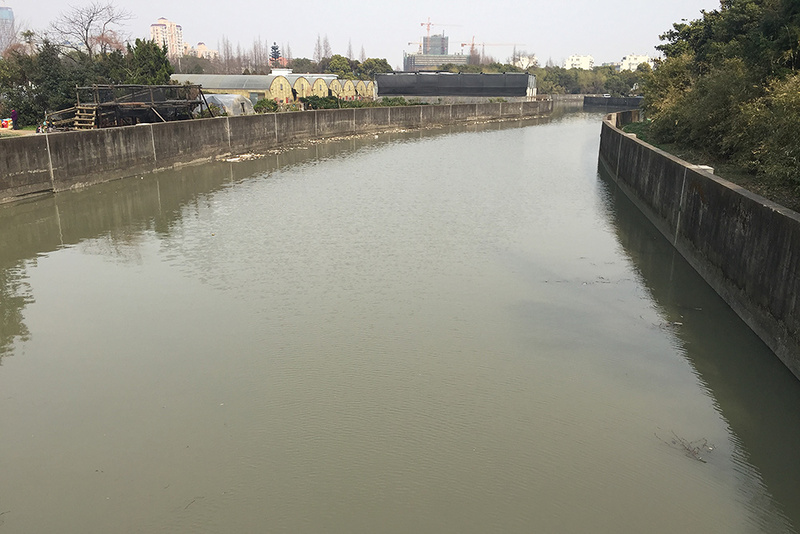 Elaine Du at pond behind Holiday Inn, Nanhui, Shanghai, 30 Jan. 2016. Elaine and I use the Swarovski ATX-95 telescope mounted atop our Manfrotto MVH502AH video head and Manfrotto MT055CXPRO3 carbon-fiber tripod. List 1 of 1 for Sat. 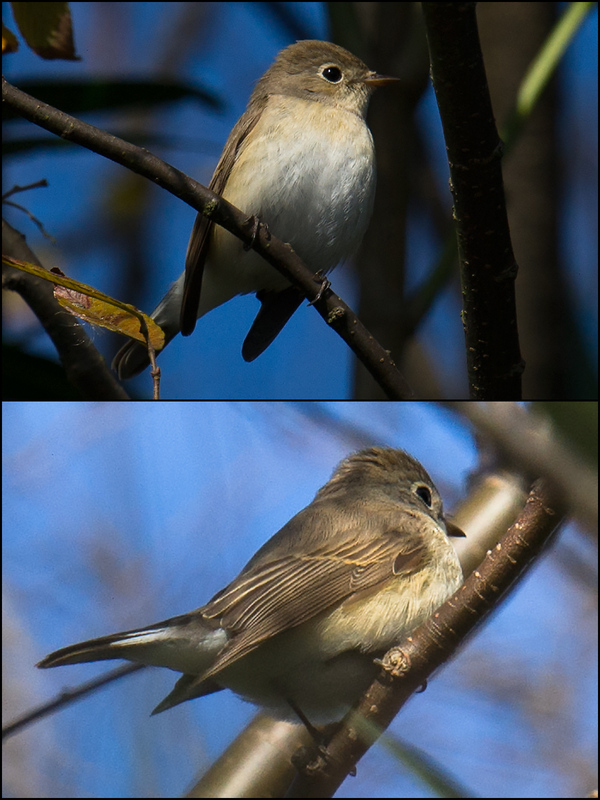 30 Jan. 2016 (50 species). Around Pudong Nanhui Dongtan Wetland (Pǔdōng Nánhuì Dōngtān Shīdì [浦东南汇东滩湿地]), Shanghai, China (30.920507, 121.973159). List includes birds found at Dishui Lake (30.908702, 121.945124) and along Shijitang Road from 31.000204, 121.938145 S to Magic Parking Lot (30.882784, 121.972782). Cloudy; low 2°C, high 7°C. Visibility 10 km. Wind N 23 km/h. PM2.5 AQI: 78. Sunrise 06:48, sunset 17:28. SAT 30 JAN 2016 08:00-16:40. Craig Brelsford & Elaine Du. 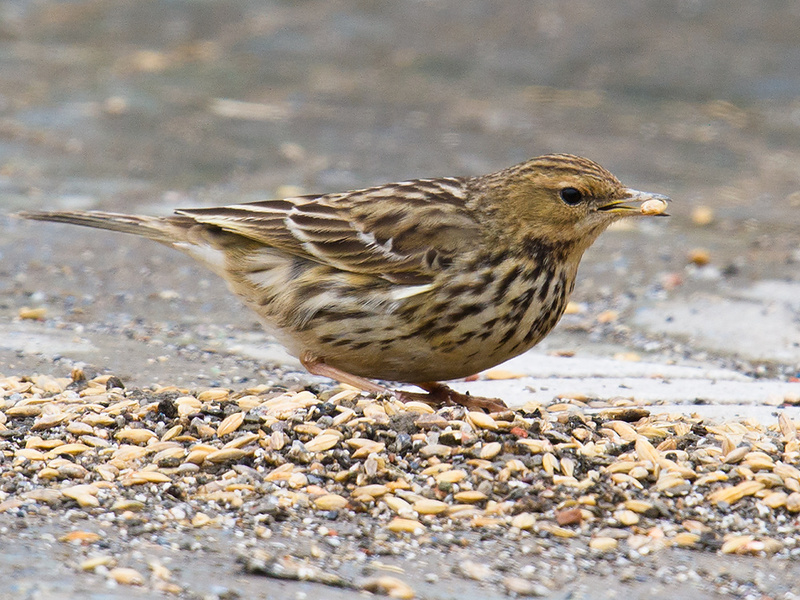 Red-throated Pipit eating grain, Nanhui, 30 Jan. 2016. List 1 of 2 for Sun. 31 Jan. 2016 (42 species). 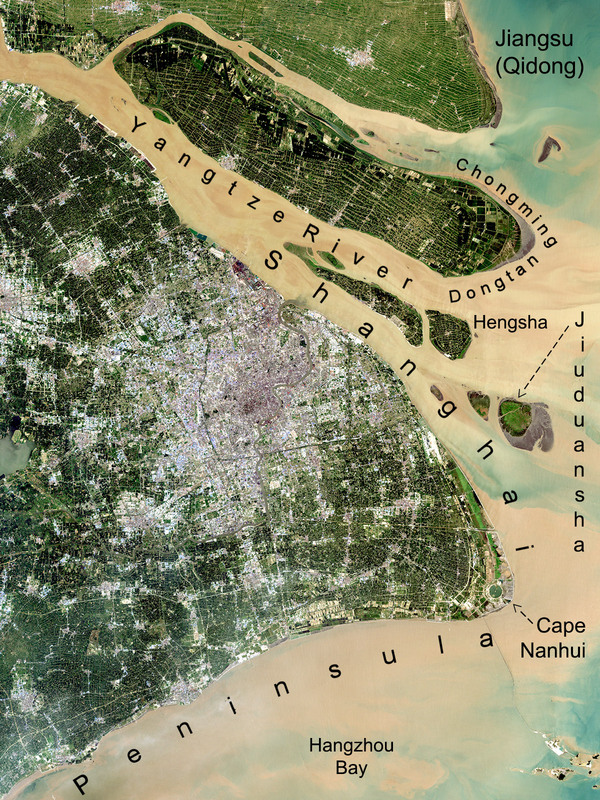 Hengsha Island (Héngshā Dǎo [横沙岛]), a small alluvial island at mouth of Yangtze River in Shanghai, China. S gate to birding area at 31.297333, 121.859434. Cloudy and windy, snow flurries in afternoon; low 0°C, high 5°C. Wind NNE 18 km/h. Visibility 10 km. PM2.5 AQI: 151. Sunrise 06:47, sunset 17:29. SUN 31 JAN 2016 07:10-12:20. Craig Brelsford & Elaine Du. Goldcrest Regulus regulus 3 on Changxing Is. List 2 of 2 for Sun. 31 Jan. 2016 (31 species). Around Chongming Dongtan National Bird Sanctuary and Nature Reserve (Chóngmíng Dōngtān Niǎolèi Guójiājí Zìrán Bǎohùqū [崇明东滩鸟类国家级自然保护区]), Chongming Island, Shanghai, China (31.510109, 121.961955). Cloudy and windy, snow flurries in afternoon; low 0°C, high 5°C. Wind NNE 18 km/h. Visibility 10 km. PM2.5 AQI: 151. Sunrise 06:47, sunset 17:29. SUN 31 JAN 2016 14:10-17:00. Craig Brelsford & Elaine Du. 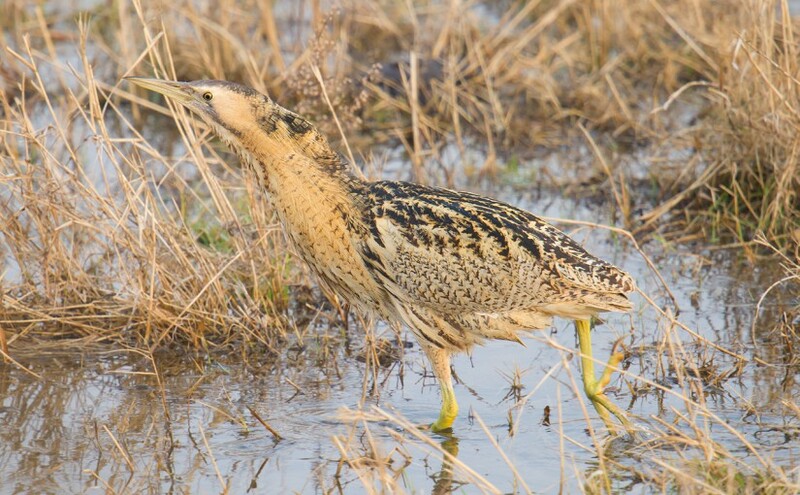 Featured image: Its cover blown, this Eurasian Bittern Botaurus stellaris emerges from hiding on Hengsha Island, Shanghai, China, 31 Jan. 2015. Photo by Craig Brelsford using Nikon D3S, 600 mm + 1.4x TC, F/7.1, 1/400, ISO 1600.